This is the second post in a series about Value Proposition Design and focuses on a technique to build a digital strategy roadmap using the VPD methodology. 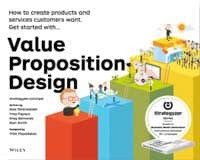 The series covers what Value Proposition Design is, what its benefits are and how it fits into a larger Digital Strategy. Click here for part 1. Also, stay tuned for our updated Digital Strategy Resources Guide. In my previous post in this series about Value Proposition Design, we covered the high-level benefits of VPD as a design thinking process. In addition to its inherent benefits, it can help establish a common language that connects 10,000-foot level thinkers with their more detail oriented counterparts, be it employees or service providers. If you missed the previous post, you might like to check out Value Proposition Design – “Just Do Me Up One Of These”. In this post, I will go into how we use the Value Proposition Design process in a slightly unorthodox way. The goal is to create an actionable digital strategy roadmap and project plans, even for solopreneurs and small business owners. So if you are interested in these outcomes, read on! So where did Value Proposition Design come from? Many of our readers who are into the start-up scene will have heard of the Business Model Canvas. 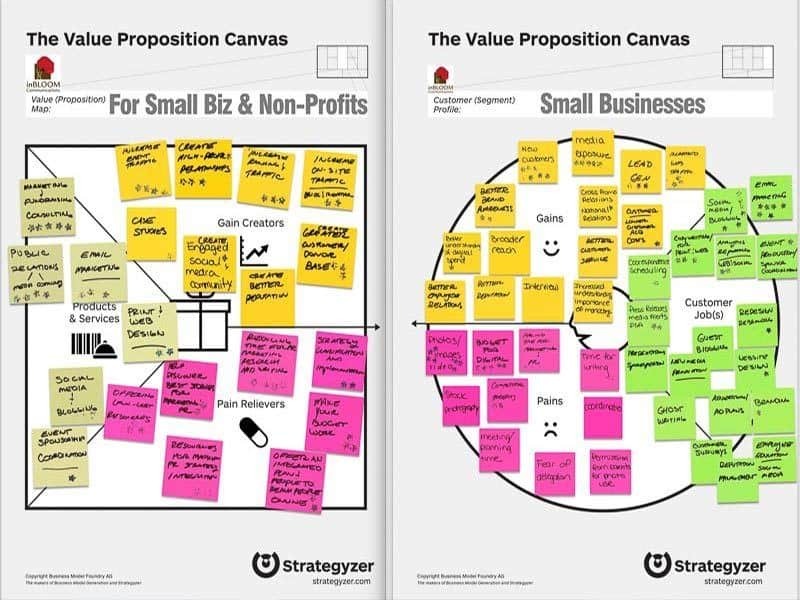 The Business Model Canvas is a strategic management and lean start-up template for developing new, or documenting existing, business models. It is one of the better known “lean” start-up processes. (Wikipedia and YouTube references). Have you and your business ever looked for partners or investors? You may not be going in front of Shark Tank, but creating a pitch for potential partners or investors in your business or non-profit happens more often than one might think. The Business Model Canvas and Value Proposition Design processes allow you to communicate and test the ins and outs of your business model. For a good overview of the canvas, check out this Business Model Canvas post on Floship. 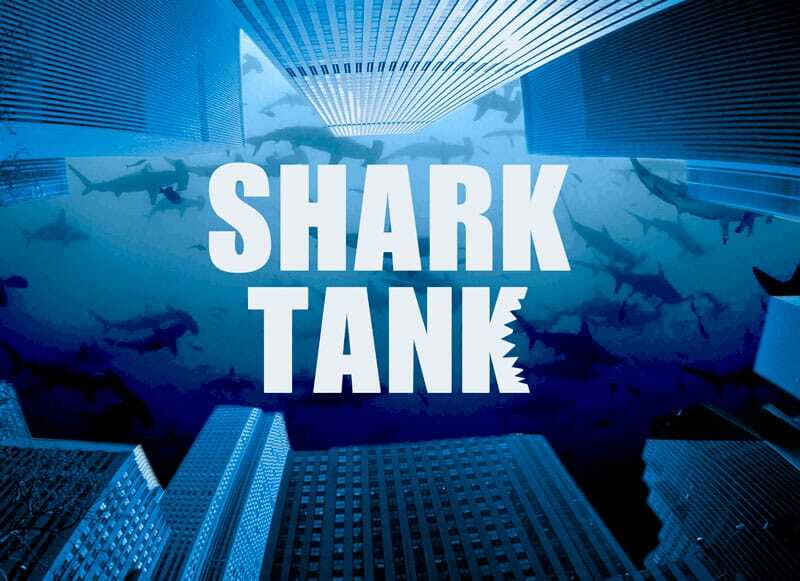 Some start-ups use it to build their “Shark Tank Ready” pitch to investors covering all the bases in terms of customer segments, product market fit, financials, etc. But it is also a terrific process to test out the viability of new product and business ideas. And we use it in a unique way to feed into our digital strategy roadmap process. 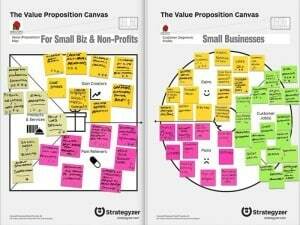 Value Proposition Design (VPD) was authored by Alex Osterwalder and his team at Strategyzer.com, and has emerged as a subset of the Business Model Canvas. It focuses specifically on understanding customer segments and product-market fit of your products and services. The clear value proposition definitions that emerge from a VPD exercise are extremely useful, regardless of where in your business life-cycle you currently are. As I touched upon in my previous post, we often find that many of our clients benefit hugely from creating clear value proposition statements around their products and services. Often these have not been formally established and can be used to connect their various marketing activities and projects in a strategic and holistic way. I should note that we at Polymash use VPD in a slightly unorthodox way: We do not necessarily create fully fledged Shark Tank ready business plans and pitch decks for investors. 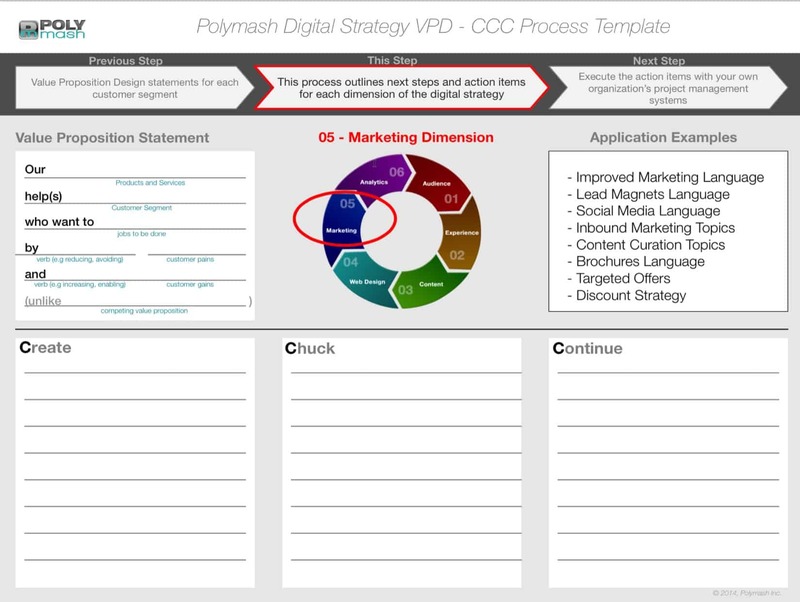 More often we use the initial stages of the VPD process to feed into our own Digital Strategy Design methodology, which creates actionable plans across multiple dimensions of a digital strategy roadmap. And we do not focus only on supporting start-ups but have found ways to help businesses of any size, including solopreneurs, small businesses, and corporates. To see why this works so well for us, read on. In short, we call this process “inbound design“, the intentional design patterns and practices that more easily allow you and your business to be customer-centric, and as a result to attract, convert, close and delight your audience and turn them into customers. Another point of differentiation is that we start by focusing on existing assets, rather than on deficits. Starting with what already works well and can be built upon is a more energizing experience for clients to work on, rather than on solely zooming in on gaps that exist. 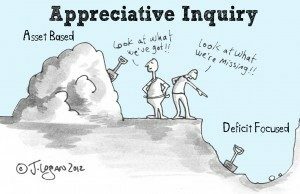 The “Strength-Based Approach” we use is based on applying “Appreciative Inquiry” methodology. It creates a more collaborative and blame-free environment, with people more willingly contributing and implementing changes, all the while feeling like they are co-creating their own digital future presence. How Does A VPD Workshop Function, And Who Should Attend? It is best to invite a facilitator familiar with the VPD process run the workshop. As far as attendees, we think that 3-25 stakeholders are a good size, depending on the size and complexity of the business or product set being worked on. It is, of course, a good idea to get diverse representation from inside the business. Business owners or C-level execs, product management, marketing, operations, and sales should all be represented. For small businesses, the owners and supporters that know the business intimately can suffice. But getting input from actual clients representing different customer segments is valuable. For example, if you were developing an educational product or business it would be great to have representation from students, teachers as well as parents. VPD workshops can be conducted in a single day or spread out into smaller sessions in multiple days, but it will be difficult to be productive in just a few hours. Building a digital strategy is a strategic effort, and we recommend doing at least 2 sessions, usually on separate days. Session One focuses on customer profiles, value maps and product marketing fit. It produces “Value Proposition Statements” as an end of session deliverable. Session Two can have fewer attendees who focus on project planning as part of a larger digital strategy roadmap. 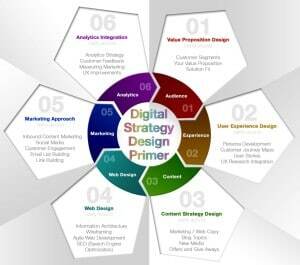 This is achieved by feeding the VPD statements into each relevant dimension on our Digital Strategy CCC Process. To stimulate thinking during the workshop, the VPD process provides a series of trigger questions that lead participants to consider aspects they may not have thought of before. “Jobs to Be Done” trigger questions explore key jobs customers do, as well as contexts and even emotional states in which they operate. “Pains” trigger questions focus on pains customers may experience in their daily lives, in terms of money, time, effort and frustrations they may encounter. “Gains” trigger questions explore potential gains, in terms how saving time, cost, effort or increased quality can delight customers and lead them to achieve their aspirations. 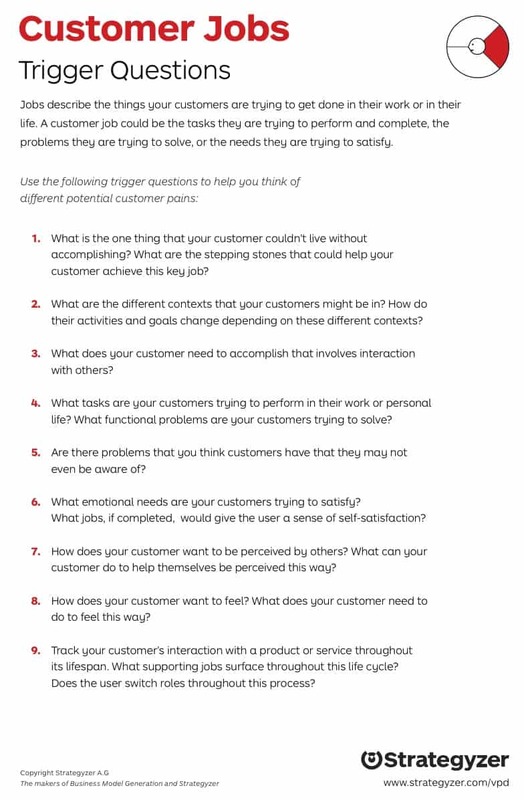 Trigger questions are also used to explore your current of future products and services, and how well these products and services address gains or pains of each customer segment. Depending on the number of people in the room, the activities can be split into sub-groups, each working a separate customer profile or product profile for example. We use whiteboards with large VPD diagrams to work on and place sticky notes with participant ideas to record all ideas. 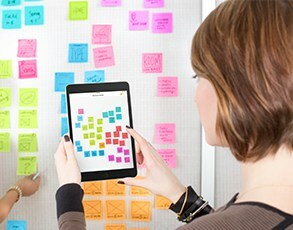 The sticky notes can be prioritized and sorted in a number of ways. We are fond of “Dotmocracy” sorting, where every participant gets 10 small “dot” stickers they can vote with by placing a dot on the ideas they like best. 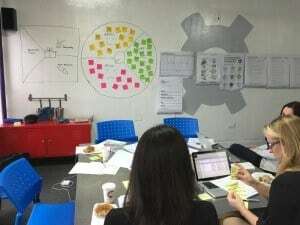 One of my favorite apps in this process is “Post-It Plus App”, which takes a photo of the entire whiteboard and produces digital “sticky note” square images that can be assembled and used to create great looking workshop documentation and client reports after the session. “Value Proposition Statements” are a quick but formalized way of describing how your products solve problems or create gains for each of your customer segments. One has to experience the entire process to see how amazingly concise and nuanced the VPD can be for each customer segment. The format to follow is illustrated in the example to the right, taken from a recent educational website we are building for a client. This occurs when you have evidence that customers care about certain jobs, pains or gains, and have designed a VPD statement that matches your product or service up with these needs. Occurs when you have evidence that your existing products and services are actually solving customer pains and providing gains the market. In short, you are in the process of getting traction. The goal is to take the VPD insights gained and to then apply the carefully crafted VPD statements to all segments of a digital strategy. Application areas quickly become obvious. Good VPD statement can drive Content Strategy. For example, clarity gained around customer segments and what they truly value will help you create an editorial calendar with more relevant topics for blog posts that better connect your target audience. Think of how your website is structured. Think about how it is laid out, the pages that exist today. Can VPD help you improve your site design to make the content more compelling, more relevant to your audience? Can you think of creating sections and content that better connect with your customers and “speaks” to their needs? The answer has been a resounding “yes” in our experience. It can inform what pages to A/B test, VPD design can drive SEO keyword and Google AdWords research, it can drive link building efforts, the list goes on. Not all businesses have a UX practice in place, but many smaller and start-up businesses have at least built design personas to understand their customer better. VPD is terrific input into many UX processes, from Design Personas to Customer Journey Mapping or Core Model Designs. When it comes to Marketing, there are too many application areas to even mention. Obviously VPD improves the overall marketing language by being more focused and clear about needs and wants of each customer segment. But it also provides a basis for social media posts, topics of content curation, targeted offers, discount strategy and so on. Applications are only limited by a marketers imagination. Lastly, the overall VPD process creates clarity around what to measure and where to apply analytics. This can help in setting up Google analytics segmentation, can be used to drive SEO keyword research. And of course, the output of analytics can then also be used to inform the next phase of validating, refining, changing and adjusting the overall strategy from year to year. Building a Digital Strategy Roadmap does not need to be complex or expensive. The overall investment of time is relatively low when compared to the results and ROI we have observed from this approach. And the way in which these insights can be executed can vary from simple to do lists to more robust project planning tools for larger businesses. The process we use to build a holistic strategy roadmap is our Create, Chuck, Continue (CCC) process. For each customer segment and for each Digital Strategy dimension we use this process to decide which activities need to take place (Create), what should be discontinued (Chuck), and what should be kept in place (Continue). At the end of the entire workshop process, this will produce a high-level roadmap of small or large projects that need to take place in each Digital Strategy Dimension listed above. This roadmap can then easily be transferred into to do lists, editorial calendars, social media scheduling tools or an organization’s project planning software. I’m excited to be launching several new sites for clients who have gone through the entire VPD process. The client has been delighted with the VPD process, and has applied the insights to the user experience and web designs for his new site, as well as to his content strategy and all other aspects of the digital strategy roadmap we co-created. The first of these sites is called Ready4Life, it helps parents and kids by providing tools and a practical processes to help them know their strengths and discover opportunities in the world that need what they do best. 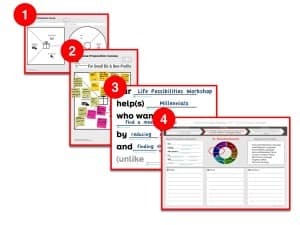 Another good example is Positivity Strategist, where we went about creating strategy roadmaps using the value proposition design methods and built a fundamentally customer-centric and inbound design oriented approach. 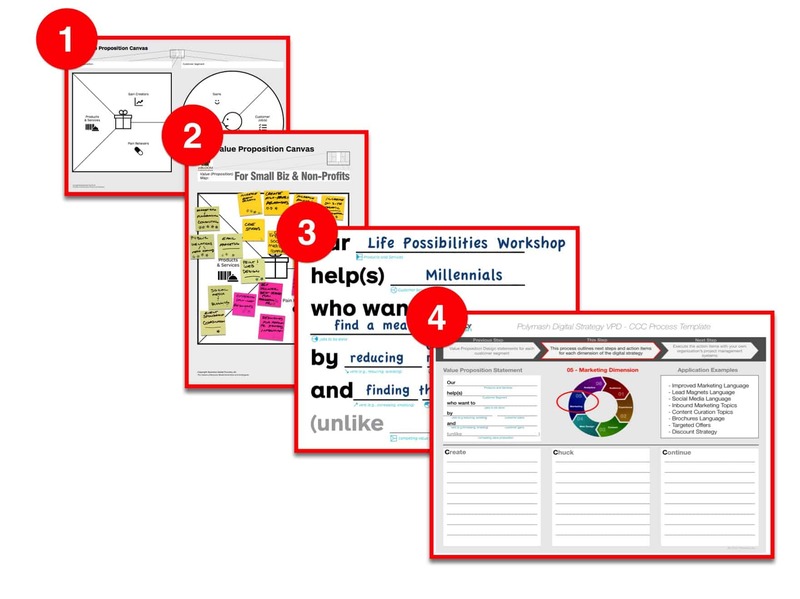 The Good Dad Project uses value proposition design patterns to help the audience self select into segments on parenting, fitness or relationships, all topics that provide different resources to each audience. I’ll be posting additional case studies and success stories soon. If you’ve read this far, I thank you for bearing with me through this rather lengthy discussion on how we collaborate with our clients to build holistic digital strategy roadmaps. Since starting Polymash as an app and web design and development company, we’ve observed that most of our engagements are never “just about creating an app” or “re-designing a website”. When asking our client’s fundamental questions about their business goals and reasons behind wanting to start a web or app project, a clear need for a holistic digital strategy usually emerged. 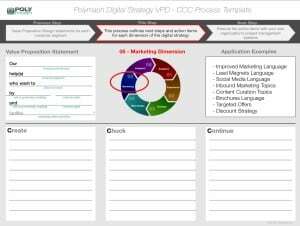 Starting with VPD and finishing with our Digital Strategy Roadmap process has made this a reality for our clients and has successfully produced significant and measurable results. I’d love to hear your views, observations or questions about this process, please feel free to leave a comment or contact us at info@polymash.com.